Barring an act of God or Duke, England should enter the home stretch of the Ashes series in the ascendancy. When Andrew Strauss and Ian Bell accepted the umpires' offer of bad light at 5.45pm, the hosts packed their kitbags content in the knowledge that their dominant day two performance, coupled with the bleak forecast for days three and five of the Test, had made Australia's task of squaring the series at Edgbaston difficult in the extreme. Much of the credit for England's position of strength belonged to James Anderson (5 for 80) and Graham Onions (4 for 58), who claimed Australia's last nine wickets for 137 runs in 40.4 overs on Friday. Their mastery of Birmingham's conditions reopened old Australian wounds against quality swing bowling, and wrested back the momentum claimed by the tourists the previous evening. Strauss and Bell reinforced England's advantage in the final session with an unbroken 56-run stand that owed something to fortune. Bell was somehow deemed not out by umpire Rudi Koertzen to a Johnson delivery that replays suggested would have thundered into middle-and-off, and the Warwickshire batsman made the most of his reprieve to advance to stumps unbeaten on 26. His captain, Strauss, experienced no such heart palpitations to finish the day on 64 not out in an innings marked by stoic defence and fluent driving. Strauss was seldom flustered as Alastair Cook and Ravi Bopara fell by the wayside to Peter Siddle and Ben Hilfenhaus respectively to further pad his lead atop the series run-scorers' list. Earlier, Anderson collected his seventh career five-wicket haul and his best return against Australia on a morning that left the raucous Edgbaston faithful in thrall. Ricky Ponting may have usurped Allan Border as Australia's leading Test run-scorer in the first session, but the morning well and truly belonged to Anderson and Onions, who more than made amends for a wasteful evening session on Thursday. Onions began in the most emphatic manner imaginable, removing Shane Watson and Michael Hussey with the first two deliveries of the second day, while Anderson bookended the first session in a similar fashion with the wickets of Marcus North and Johnson in consecutive deliveries on the stroke of lunch. Anderson's spells either side of lunch produced figures of 5 for 35, and Onions' 4 for 37 - an analysis which might well have been enhanced if not for several dropped catches off his bowling - as Australia's age-old problems against the swinging ball resurfaced. With heavy rain predicted for much of the next three days, England appear the only team capable of forcing a result, short of a major change in weather and Australian fortunes. Onions played a lead role in the only first-class result at Edgbaston this season - taking nine wickets to guide Durham past Warwickshire - and continued his love affair with the ground. Exploiting the heavy overhead conditions to full effect, he bowled unchanged for nine overs, during which he swung the ball extravagantly into both the right- and left-handers and threatened off the seam. He struck with the first ball of the day, beating a lunging Watson for pace to trap him lbw for 62. The dismissal served as an underwhelming exit for Watson, who the previous evening had gone some way to justifying the faith of Australia's selectors in his first outing as a Test opener with an assured half-century. The tremors intensified for the Australians the next ball when Onions angled a delivery into Hussey, who obliged by hoisting his bat high above his head and watching helplessly as the ball cannoned into the top of off-stump. Hussey has twice been bowled this series without offering a shot - the other to Andrew Flintoff at Lord's - and now possesses the modest record of 81 runs at 20.25 this series. Many more muddle-headed performances like this, and Australia might well ponder more changes to their XI moving ahead. Onions' would-be hat-trick ball might have been his most disappointing of the morning - a short, leg-side offering to Michael Clarke - but could not detract from an otherwise fine spell of bowling in which he probed the Australians' pads and proved a constant menace. The visitors steadied just long enough for Ponting to notch his 11,175th career run to overhaul Border's long-standing national record, but he could not capitalise on his historic moment, top-edging a hook off Onions to Matt Prior for 38. Clarke appeared the only man capable of sparing Australia's blushes, and fortune briefly smiled upon him. The vice-captain was blessed to have been ruled not out to an exceptionally close Onions lbw shout on 18, and again when dropped off the same bowler by Flintoff at second slip. Interspersed with these reprieves were some fine periods of batting in the cauldron-like atmosphere, however his hopes of leading a middle-order fightback were dashed when Rudi Koertzen adjudged him leg-before to an Anderson delivery that appeared to be slipping down the leg-side. 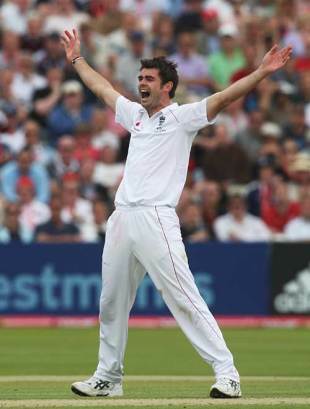 Thus commenced a superb sequence of swing bowling from Anderson. Finding the aerial movement that eluded him at Cardiff and Lord's, the Lancastrian crashed through for the wickets of North to a superb, one-handed catch by Prior and Johnson to a dubiously high lbw decision in consecutive deliveries. He rounded out the session by comprehensively bowling Graham Manou, the Australian debutant who had been presented with his baggy green cap prior to play. Australia coaxed a valuable 60 runs from their final two wickets, padding the total to a reasonable 263, but they would not emerge from the second session. Anderson prompted Peter Siddle into a feathered edge to Prior shortly after the lunch break to complete his first five-wicket haul side against the Australians, while Onions returned for the scalp of Hilfenhaus for a career-best 20.